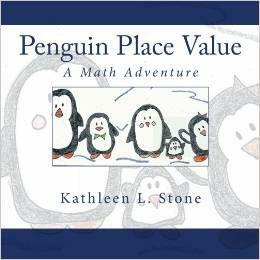 After reading my book, Penguin Place Value, the children may work with partners on Place Value Bags. Each bag contains place value base tens pieces that they pretend are fish. They figure out how many "fish" each bag contains, write the number in expanded notation, and then write the number word on their recording sheet (a paper labeled A-Z with areas to write their answers). Partners must agree on their answers and use their math journals (or word wall) to make sure they are spelling the number word correctly.